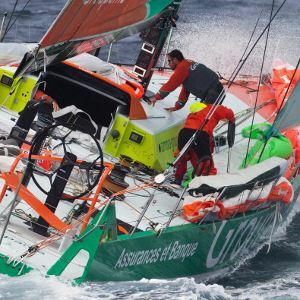 France’s Groupama was closing in on Telefonica in the Volvo Ocean Race on Tuesday as the heavy seas that pounded the fleet in the opening days of the fifth leg finally eased. Groupama, which won the fourth leg, had narrowed Spanish entry Telefonica’s lead to 11 nautical miles late Tuesday, with Camper, Puma and Sanya all within striking distance as the fleet headed towards the "Roaring Forties". Abu Dhabi trailed the rest of the six-yacht fleet by more than 250 nautical miles, forced to play catch-up after being forced to return to Auckland for repairs shortly after setting off on Sunday when it smashed into a steep wave. Camper skipper Chris Nicholson was keen to reach the Roaring Forties, the high-wind area south of 40 degrees latitude, confident his yacht could excel in the gusty conditions. "We’re trying to get there because in those fresh running conditions we have got a good boat and good team," he said. "For me, we can’t get there soon enough." The leg from Auckland to Itajai in Brazil is the longest and most difficult in the 39 000-nautical mile race, which will finish in Galway, Ireland, in July.